Become a mystery-solving detective and find hidden artifacts and lost treasures to create your own mystery museum!Swap around and match objects by color to solve mystery quests, gather your artifact collection and create your own museum decor! Beat breathtaking match-3 levels, search for hidden tre... Lihat lebih banyak Become a mystery-solving detective and find hidden artifacts and lost treasures to create your own mystery museum! Swap around and match objects by color to solve mystery quests, gather your artifact collection and create your own museum decor! Beat breathtaking match-3 levels, search for hidden treasures of ancient civilizations and carve your way through a story packed with adventurous scenes. Excited? Mystery museum is waiting for you! Customize the halls and surrounding gardenscapes to get your unique museum decor and artifact collection. Go on a journey to the pyramids of Egypt. Complete mystery match-3 levels, search for and collect lost artifacts, and adjust the museum decor to your taste! Match objects to discover ancient treasures and unexpected plot twists. You ain’t a mystery detective like Lara Croft? Of course you are, jump on in! 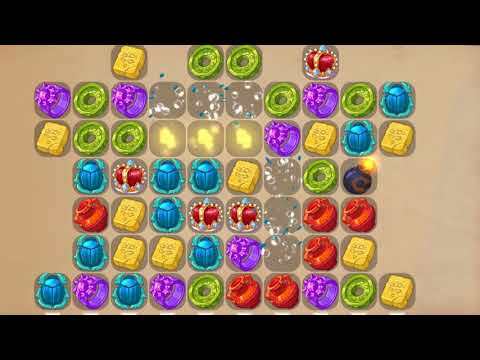 • Easy and fascinating gameplay — swap and match objects to complete match-3 levels. • Creative freedom — choose the museum decor and combine treasures into beautiful artifact collection, open new locations and build your unique museum. • Exciting storyline — restore your museum and embark on a thrilling adventure! • Unique game design — colourful game scenes and sparkling match-3 levels won’t leave you unimpressed! • Multiple game locations — crawl through haunted museum halls, match objects and solve mystery quests in ancient pyramids of Egypt and much more. • A Facebook community of mystery detectives to share your progress with. Find out whose artifact collection is the biggest!